Freedom. 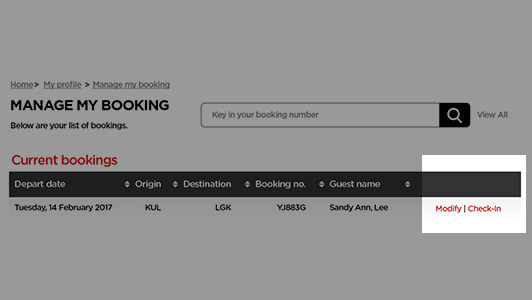 It’s at the heart of AirAsia’s award-winning loyalty programme. Welcome to BIG Loyalty, home of the world’s first Freedom Flyer Programme. It is our way of thanking you for making AirAsia the World’s Best Low Cost Airline for nine years running. We believe that freedom is the choice--your choice--to travel to over 130 destinations in AirAsia’s network and experience more than ever before. No matter who you are, flying more with AirAsia is a rewarding experience. Earn BIG Points depending on your chosen fare type and how much you spend. The more you fly, the faster you’ll progress through our membership statuses, which enables you to earn even more BIG Points. Come aboard and enjoy better rewards, simply by flying more with AirAsia. One way flight operated by AK, FD, QZ, Z2, I5, DJ and XT are counted as one (1) flown sector, while one way flight operated by D7 and XJ, including fly through is counted as two (2) flown sectors.A few exceptions may apply to carrier code D7 and XT flights. All travel must be completed within one calendar year or anniversary year for co-brand credit card cardholders. 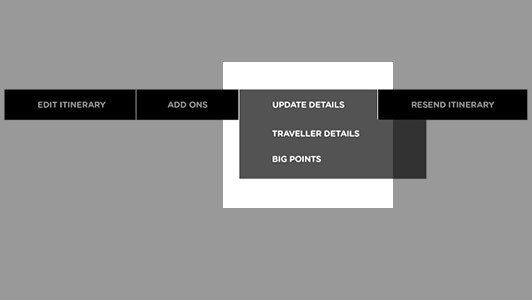 BIG Points are also awarded for any add-on products following the chosen fare type. Promo fares are excluded. DJ - DJ - AirAsia Japan Co., Ltd. Check out our BIG Loyalty Membership Terms & Conditions. This document is the contract between you, the BIG Member and Think Big Digital Sdn Bhd, the operator of the BIG Loyalty, and contains the terms and conditions governing the use of the BIG Membership under the BIG Loyalty which is binding on you. These terms & conditions shall be applicable and binding on all types of BIG Loyalty, including any co-branding arrangements with our respective partners. The BIG Loyalty is owned and operated by Think BIG Digital Sdn Bhd (“BIG”). 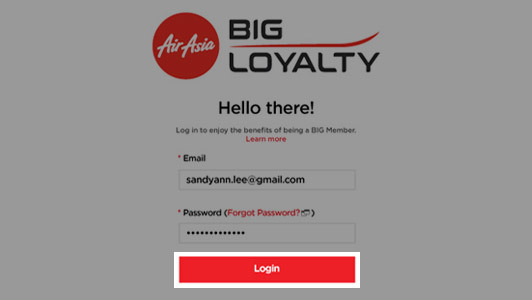 The BIG Loyalty is a loyalty and/or rewards programme whereby all AirAsia BIG Members are issued with an BIG Member ID which can be used to earn BIG Points under the BIG Loyalty, subject to the terms and conditions of this Agreement. Membership under the BIG Loyalty is open to all individuals globally. You can register for BIG Membership online at the Website, mobile application or via any other means/channels as determined by BIG from time to time. We reserve the right to charge a membership fee at our sole discretion. During the application process, you will be required to verify your email address. If you do not verify your email address within seventy-two (72) hours from the time you commenced the application process, then your application for the Membership will be incomplete and we will not be able to process or approve your application. If you still wish to apply for the BIG Membership, you will then have to make a fresh and new application at the Website. Each Member is only entitled to have one (1) Account. Members are not allowed to have multiple Accounts and enrolment of several persons in a single Account is also not allowed. Whilst the registration for the Membership under the BIG Loyalty is open to all customers, we reserve the right to reject ANY application and/or to decline any application for the Membership at our sole and absolute discretion without assigning any reasons whatsoever, and our decision shall be final and conclusive. Member may request merging of his/her Accounts if Member has multiple Accounts. Prior to the merging of multiple Accounts, BIG will perform authentication to verify that the BIG Member IDs belong to the same Member. Upon successful authentication, Member needs to choose the principle Account where all the BIG Points from the other Accounts will be transferred into and merged. Merging of Accounts is final and cannot be reversed. Once merging of Accounts is completed, the Member can only redeem and access his Account from the principle Account and the merged Accounts thereafter can only be used to earn BIG Points without accessibility for any features including redemption of any privileges. BIG Points that are awarded as a one-time bonus for registering and/or joining the BIG Loyalty i.e. “welcome points” will not be transferred to the principle Account pursuant to the merging of Accounts. In the event of multiple Accounts held by Member, he/she may request BIG to transfer his/her BIG Points between these multiple Accounts. Subject to BIG performing authentication to verify that the BIG Member IDs of these multiple Accounts belong to the same Member, the transfer of BIG Points will be completed by BIG within a reasonable timeframe. 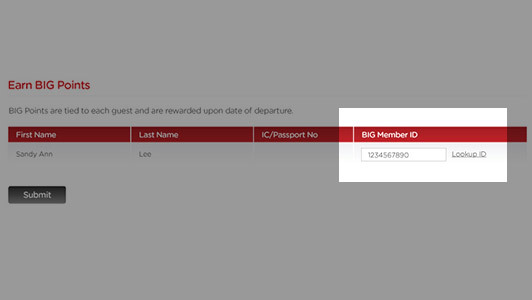 There are four (4) Membership status (“Status”) under AirAsia BIG Loyalty’s Frequent Flyer Programme. The entry level is Red. Members may progress to the higher status – Gold, Platinum and Black by earning Qualifying Flown Sectors. Qualifying Flown Sectors refers to the point where passengers first board an aircraft and the passenger’s destination. Fly-Thru, which refers to a process of transfer from one flight to another flight without the need of going through the immigration process nor the need to collect the baggage when taking two (2) different flights to reach the final destination and stopping over at a transit station, is computed as two (2) Qualifying Flown Sectors. No Qualifying Flown Sectors and/or BIG Points awarded for redemption on all AirAsia flights (including any ancillary booking) through BIG Points and/or BIG Points plus cash at www.airasiabig.com. *Table A above may be subject to change from time to time at BIG’s sole and absolute discretion. Short haul flight(s) are counted as one (1) Qualifying Flown Sector. Long haul flight(s) including fly-thru are counted as two (2) Qualifying Flown Sector(s). Non-revenue fare class such as charter flights, staff related benefits and duty travel. Black Membership status also includes Members who have been personally invited by BIG following internal review and approval. Membership Status promotion or upgrade for Members will be implemented immediately upon satisfaction of the Qualifying Flown Sectors. Membership Status promotion or upgrade for Co-Brand Credit Cardholders will be enforced immediately upon satisfaction of the Qualifying Flown Sectors or the bank and airline minimum spend criteria as shown below in Table C.
Membership Status promotion or upgrade will be reflected in the system on the 1st day of the subsequent month. The promotion or upgrade date does not supersede the Membership Status review date which is done at the end of every calendar year i.e. the calculation period for the number of Qualifying Flown Sectors to determine the Membership Status will be based on the past twelve (12) months. Membership Status demotion for Members will be enforced at the end of every calendar year upon review of the Qualifying Flown Sectors flown by the Member. Membership Status demotion for Co-Brand Credit Cardholders will be carried on the anniversary month of the relevant Co-Brand Credit Card. Membership Status demotion will be reflected in the system by the 15th day of the subsequent month. *Table B above may be subject to change from time to time at BIG’s sole and absolute discretion. 2 – Airline Minimum Spend covers all spend including base fare, special service request, airport tax, goods and services tax (“GST”), processing fee etc. (b) Flown from twenty four (24) to forty nine (49) Qualifying Flown Sectors flights with AirAsia and its affiliates. A Member who is an AirAsia BIG Credit Co-Brand Cardholder, who is not able to satisfy criteria (a) or (b) as stipulated above, will be placed in the default status pursuant to the Qualifying Flown Sectors flown in the preceding twelve (12) months. Every Member is only entitled to hold one (1) AirAsia BIG Credit Co-Brand Card and the review of the Membership Status will be based on the joining date (when they were issued with their cards) of the first AirAsia BIG Credit Co-Brand Card which will supersede the BIG Membership joining or registration date. The BIG Membership is a lifetime membership programme. Once you receive your BIG Member ID, you may use it to earn BIG Points at any Merchant that has been signed up by BIG under the BIG Loyalty for points issuance. The Membership and BIG Member ID is non-transferable and shall only be used by you as the Member. You should frequently review your Account to check and verify your current BIG Points balance. By subscribing for the Membership, you agree and undertake:- (a) not to use the BIG Member ID for any unlawful and/or fraudulent activities ; (b) not to engage in misconduct or breach any rules governing the BIG Loyalty, including, but not limited to the fraudulent acquisition or earning of BIG Points or sale/redemption or abuse of BIG Points or acquisition, sale/redemption or abuse of any benefits; and (c) to only use the BIG Member ID in accordance with the terms and conditions of this Agreement. If we find that your BIG Member ID has been used for unauthorized commercial activities with a view to profit, unlawful or fraudulent activity or purposes which are unacceptable to us, we shall be entitled to suspend, block and/or terminate your Membership (including forfeiture of accumulated BIG Points and blocking of your BIG Member ID under the BIG Loyalty) immediately without prior notice to you. The Member is the individual who personally registers for Membership under the BIG Loyalty and has been issued with a BIG Member ID. As a Member, you will be able to earn BIG Points at all designated Merchants who have been signed up by BIG under the BIG Loyalty for points issuance, and also to access and view your BIG Points balance and transaction history online at the Website. If the applicant for the Membership is below 18 years old, the parent and/or guardian of the minor needs to complete the application form for Membership for and on behalf of the minor and the parent’s and/or guardian’s information has to be updated in the Website. Upon the minor turning 18 years of age, he/she is deemed to have personally accepted all the terms and conditions for the Membership. We may from time to time introduce new services, offers or programmes in relation to your Membership under the BIG Loyalty that offer promotional items or other special terms as we may apply from time to time to a category of transactions. We will tell you of the terms and conditions of such services, offers or programmes at the time of the introduction of the services, offers or programmes (if any). The terms and conditions of such services, offers and programmes are binding on you as if the same are contained here. More than one service(s), offer or programme may apply to your Membership under the BIG Loyalty at the same time. We are entitled to introduce and terminate any such service, offer or programmes from time to time at our absolute discretion. You can use your BIG Member ID under your Membership to earn and collect BIG Points at any Merchants registered under BIG or under any other initiatives or under any other programmes devised, introduced, offered and or managed by BIG from time to time. Any retrospective claim by a Member is strictly subject to the terms and conditions contained herein and Merchant’s terms and conditions and up to the maximum timeframe of sixty (60) days from the date of flight departure/flown. The final discretion to award BIG Points on any retrospective claim rest solely with BIG. No retrospective claim is allowed by any Member who failed to register as a BIG Member at the time of flight departure/flown. Without prejudice to the above, we shall not be responsible for the refusal of any Merchant to honor or accept your BIG Member ID. The BIG Points earn structure varies by each Merchant. The full list of merchants and BIG Points earn structure is available on the Website. Please take note that for AirAsia flights, you may earn AirAsia BIG Points on certain flights only subject to AirAsia’s terms and conditions. The BIG Points earn structure may be subject to change from time to time as determined by BIG. BIG reserves the right to add, remove, substitute or change Merchants and the BIG Points issuance, conversion or redemption structure from time to time at our sole and absolute discretion. BIG Points earned will be posted to your Account based on the respective Merchant’s own terms and conditions (and the Merchant’s stipulated time frame stated in their terms and conditions). This means that the number of days as to when the BIG Points will be credited and reflected in your Account, will depend on the respective Merchant that you have earned points at. Hence, for avoidance of doubt, the time period for BIG Points to be credited and reflected in your Account varies from Merchant to Merchant and will depend on the respective Merchant themselves. Accordingly, BIG assumes no control, responsibility or liability as to the time period or the award and crediting of BIG Points from the respective merchants to the Members. Adjustments will be made to the BIG Points accrued in the Member’s Account if there are any credit(s) or debit(s) posted to the Member’s Account, including those arising from returned goods or service fees from billing disputes. Any disputed transactions/billings will not be credited with BIG Points. BIG reserves the right to change, at any time without prior notice, the number of BIG Points and where applicable, the number of BIG Points plus Ringgit value that are required to be redeemed for any of the items provided under the AirAsia BIG Redemption programme. 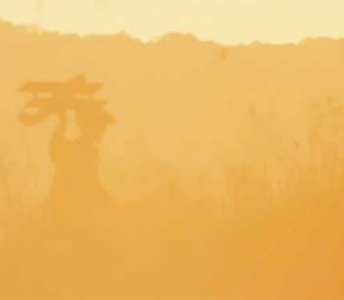 You acknowledge that BIG assumes no contractual or legal responsibility to you and has specifically limited its legal obligations in its arrangements with the respective suppliers, Merchants and partners under the BIG Loyalty. The accumulation of BIG Points does not entitle a Member to any vested rights. In earning and accumulating BIG Points, Members understand that they may not rely on the continued availability of any award, premium, or other benefit. BIG will not be responsible for any delay in the posting of the transactions and/or the accrual of the BIG Points. All BIG Points accumulated will be reflected in the Members Account activities list on the Website. Members may view their BIG Points under the activities list at the Website. Any disputes arising over the BIG Points statement must be notified to us within one (1) month from the date of the relevant statement. You must provide us with supporting documents wherever applicable to assist us in settling any disputes. If we do not receive any notifications from you within the stipulated time frame of any disputes or inaccuracies in your BIG Points activities list, the statement will be taken to be correct, final and binding on the Member. BIG’s decision on any such disputes are final and conclusive. * Table C above may be subject to change from time to time at BIG’s sole and absolute discretion. Qualifying Flown Sectors are awarded to Members on any promotional fares but Members do not qualify to earn BIG Points on any promotional fares. A Member who is upgraded to a different class of travel without a reissuance of their flight ticket will receive BIG Points for the fare the Member purchased, as reflected on the ticket. Effective 1st January 2017, AirAsia BIG Points will remain valid for a period of thirty-six (36) months from the date of last activity and the total BIG Points balance in Member’s Account will automatically expire at the end of the 36th consecutive month for which the Member has not earned or redeemed any BIG Points. The expired BIG Points will be deducted from the Member’s Account. There will be no extension period or further time frame given for the redemption of any unused and expired BIG Points, unless otherwise determined or approved by BIG. In addition to the standard validity period of BIG Points as stated above, BIG also retains the discretion to configure a different expiry date for different types of BIG Points that are awarded under specific promotions/campaigns which may have a different validity period as determined by BIG from time to time. Any adjustment of credit due to failed or disputed transactions. Flight redemptions i.e. AirAsia flights. This may include AirAsia ancillary products redemption. Non-flight redemption – other rewards, benefits, services, merchandise or other redemption items introduced or offered by BIG from time to time. 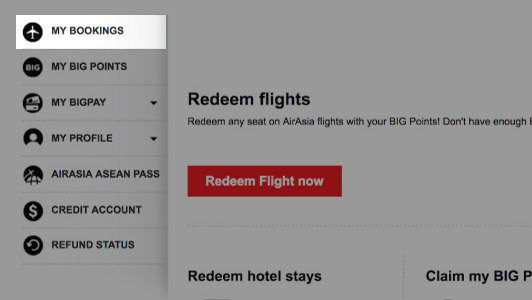 When a Member redeems his BIG Points for any redemption items (including but not limited to AirAsia flights), BIG will proceed to deduct the stipulated number of BIG Points required for the said redemption item from the Member’s Account and will hold the BIG Points (for a period as deemed necessary by BIG) until the full payment for the said redemption item (including any balance of payment for the redemption item and taxes that may be due to BIG and/or the respective Merchant) is completed by the Member and a successful payment confirmation is provided by the respective Merchant to BIG. BIG will proceed to credit back the previously held BIG Points to the Member’s Account upon receipt of an unsuccessful payment confirmation from the respective Merchant. Suspected or actual fraud and/or suspected or actual abuse relating to the accumulation of BIG Points under the BIG Loyalty may result in forfeiture of accumulated BIG Points, cancellation of the Member’s BIG Member ID as well as cancellation of a Membership and the Member’s participation in the BIG Loyalty. Any BIG Points relating to a transaction which is or has been cancelled. BIG Members are prohibited from engaging in willful misconduct or breach of any rules governing the BIG Loyalty, including, but not limited to the fraudulent acquisition or earning of BIG Points or sale/redemption or abuse of BIG Points or acquisition, sale/redemption or abuse of any benefits. BIG reserves the right to suspend, block and/or terminate the Member’s BIG Member ID as well as the BIG Membership and to immediately cancel any such transaction and/or redemption made by the Member. BIG reserves the right to deduct any BIG Points as stated above without prior notification to Members. BIG will not (a) replace, or (b) assist a Member by placing a hold or freeze status on any misplaced, lost or stolen reward vouchers or tickets under any circumstances whatsoever. Effective 1st January 2017, a Member can nominate up to a maximum of ten (10) EFM at any one time to be in the Member’s redemption group. This also includes a child who is treated like an adult. BIG shall not be responsible for any incorrect redemptions made and in such circumstances will not refund any BIG Points incorrectly or mistakenly deducted. 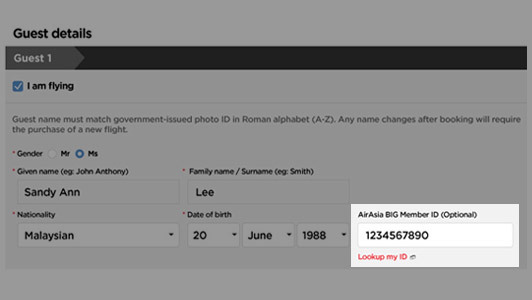 AirAsia BIG Members can change or remove EFM’s in their redemption group ONCE A YEAR regardless of the number of EFM’s changed or removed. No further changes to the Member’s EFM will be permitted thereafter during the same year. New, additional or replacement EFM’s are eligible for redemption benefits once their names are registered in a Member’s Membership Account as an EFM. This may take up to fourteen (14) days from the date of receipt of the nomination(s) by BIG. BIG Points can only be redeemed after being reflected in the Member’s Account. Redemption of rewards with insufficient BIG Points will not be processed. BIG will not be responsible for any delay in the posting of the transactions and/or the accrual of the BIG Points. There is NO TRIAL PERIOD for all reward items redeemed. All redemptions are subject to the accumulation of sufficient BIG Points and subject to BIG’s final acceptance. Orders will be cancelled automatically in the event of insufficient BIG Points. Prices and redemption BIG Points printed are correct at time of print and are subject to change without prior notice. BIG’s failure to enforce particular terms and conditions regarding the BIG Points and/or under the BIG Loyalty does not constitute a waiver of those terms and conditions by BIG. BIG reserves the right to change, substitute or terminate any of the redemption rewards and redeemable items under the BIG Loyalty at any time with or without prior notice. In the event of unauthorized use of your BIG Member ID, you should notify us through web form, email, Facebook, Twitter or Weibo. We may block the redemption function of your accumulated BIG Points upon receipt of your notification. You should then send a confirmation in writing to us. We shall not be responsible or be held liable for any disputes or loss suffered by you in relation to any transactions incurred from unauthorized usage of your BIG Member ID. You shall be and remain liable for all transactions incurred from unauthorized usage of the BIG Member ID, where investigations made by us reveal that you are a party to any actions regarding any transactions effected through the use of your BIG Member ID by any unauthorized person. Without prejudice to our rights and notwithstanding that you may have exercised all reasonable precaution to prevent the unauthorized use of your BIG Member ID, you shall remain liable to us if you have acted fraudulently. If you wish to update your profile and personal data, including but not limited to, mailing address, contact details, phone numbers, email address, and other personal particulars, you need to log in to your Account and update your profile and personal data directly. These updates may take up to twenty-four (24) hours before it is reflected in your Account details. You shall at all times keep all your passwords and security codes, security questions, security answers (including but not limited to those used for verification and authorization purposes and for access into your Account) secret and you shall use all reasonable precautions to prevent disclosure of the same to any unauthorized person, or third party. We shall not be responsible and shall not be liable for any loss suffered or in relation to the BIG Points transactions on your Account (whether online at the Website or for any unauthorized transactions on your Membership and BIG Member ID), if you disclose any of your passwords, security codes, security questions, security answers or any of your personal details to unauthorized parties or third parties. By entering into this Agreement, you agree and undertake to pay all fees arising out of and in connection with the BIG Loyalty including costs, expenses, and any other applicable taxes (including GST), duties and levies, where and if applicable. We reserve the right to charge any fees that may be applicable for any services provided under the BIG Loyalty (in the form of deduction of BIG Points or via cash payment) as we may determine from time to time, and to revise such fees or to charge additional fees (if applicable) for new services which may be offered by us from time to time. All fees paid to or in connection with the BIG Loyalty to us are non-refundable under any circumstances whatsoever. For full details of any applicable fees, please refer to our Website. Transaction history in the form of activities list detailing your BIG Points, shall be available online under your Account profile on the Website. The activities list is ONLY accessible by the Member by using his/her own user ID, password (and security hint question where applicable). All entries in the transaction history are deemed true and accurate unless you inform us of any error, exception, dispute or unauthorized transaction within one (1) month from the date of the transaction. If we do not receive any written notification from you concerning any error in the transaction history within the stipulated timeframe, the statement shall be deemed true, complete and accurate, and you shall then be deemed to have accepted the entries in the transaction history made up to the date of the last entry in the transaction history as final and conclusive. In the event the investigations and verifications conducted by us reveal that the disputed transaction(s) (BIG Points accumulated) were accurate, you shall be liable to indemnify us against all the other costs, expenses & charges that we may incur in the verification processes of the disputed transactions/BIG Points accumulated. Our findings in any investigation conducted shall be conclusive, final and binding on you and shall not be opened for questioning in any event. We shall be entitled from time to time to contact you via electronic transmission (including, but not limited to email communication, telex, fax), short messaging services (‘SMS”), or via telephone correspondence, and any other means of exchange communication in respect of, but not limited to, the confirmation of transactions, whether or not you transacted the same, status of your Membership, your Account, BIG Points, and communication on promotions with regards the BIG Loyalty. BIG, AirAsia and/or Tune Money shall also be entitled to send you offers, promotional and marketing material with regards the BIG Loyalty from time to time. Any telephone calls placed by us to you will not be deemed as unsolicited calls by you. From time to time we may monitor and/or record telephone calls between you and us. You agree that the monitoring and/or recording may be done and that no additional notice to you or additional approval from you is required. if you use your Membership and BIG Member ID for any unlawful activities; or if you commit or threaten to commit a default or breach of any terms or conditions set out in this Agreement; or if you have furnished false or misleading information or data to us, including false information concerning your personal information and details; or if in our absolute opinion, your Account has not been operated satisfactorily or used for fraudulent purposes; or if we have noticed irregular, suspicious or unauthorized activity in relation to accumulation of BIG Points; or if an event or events has or have occurred or a situation exists which should or might in our opinion prejudice your ability to perform your obligations under this Agreement; or if we in our absolute discretion decide to cancel or terminate the use of your Membership, your participation in the BIG Loyalty , your BIG Member ID, or if there has been suspected or actual fraud and/or suspected or actual abuse relating to the accumulation of BIG Points by you. In such circumstances, any accumulated BIG Points shall be forfeited and we shall cancel your Membership, your BIG Member ID and, your participation in the BIG Loyalty. We reserve the right to take any action against you as may be deemed necessary or as may be required under governing laws or by the relevant governing authorities. We reserve all rights to decline or terminate your application for Membership under the BIG Loyalty at our sole discretion without any prior notice to you if we find that you have furnished false or misleading information to us concerning your personal information and details. We may at our sole and absolute discretion, limit, block, suspend or terminate your Membership and your participation under the BIG Loyalty and the BIG Member ID (including the forfeiture of accumulated BIG Points), if we detect any unusual, irregular, suspicious, fraudulent or unauthorized activity with regards to your Membership, Account and/or BIG Points; or there is a contravention; non-adherence or breach of any of the provisions of this Agreement. We shall have the right to withdraw at our absolute discretion, all or any of the facilities provided by us (including those under the BIG Loyalty, including the termination of the BIG Member ID and forfeiture of any accumulated BIG Points) in connection with the use of your Membership at any time with or without notice and without assigning any reasons for it. If we detect unusual, irregular, suspicious, unauthorized or fraudulent activity on your Account, we may reject the Transaction, suspend the Account and/or block the use of your BIG Member ID immediately as security/precautionary measures (with or without prior notice to you) until we can verify the activity. You may at any time of your own accord cancel your Membership by sending a notice in writing and/or email notification to us. We will then terminate your Membership and your participation under the BIG Loyalty, and your BIG Member ID will no longer be valid for use to earn and/or redeem BIG Points. The cancellation of your Membership is an irreversible process and the cancelled Membership cannot be reinstated in any way whatsoever. Any BIG Points accumulated and/or remaining in your Account at the time of cancellation will be forfeited. We may at any time vary, revise, amend, withdraw, substitute, add or remove any of the terms and conditions of this Agreement. The revised or new terms will apply, including, without limitation, to all future transactions using the Membership and the BIG Member ID and redemptions of BIG Points under the BIG Loyalty. The revised terms and conditions will take effect upon the same being posted on the Website. In addition, we may issue a notice to you concerning any revision to the terms and conditions. Notwithstanding the foregoing, advance notice of any change may not be given if it is necessary to make any such change immediately. Any amendments, alterations, additions, withdrawals and/or termination changes may affect BIG Points which a Member has already accumulated as well as any future accumulation of BIG Points. The retention or use of your Membership or BIG Member ID or redemption of BIG Points after the effective date of any variation, revision or change of terms and conditions shall be deemed to constitute acceptance of such variation, revision or change without reservation by you. If you do not accept the proposed variation, revision or change, you are entitled to terminate the use of your Membership under the BIG Loyalty by contacting us, and the provisions relating to termination above shall apply. Notwithstanding the above, BIG specifically reserves the right to withdraw or terminate the Membership and the BIG Loyalty (in whole or in part), any programme or benefit thereunder at any time with 3 months prior notice to Members. We advise you to check the terms and conditions regularly whenever you visit the Website to ensure that you are aware of our latest terms and conditions. We shall also be entitled to disclose and you irrevocably consent to our disclosure of any information pertaining to you, your Membership, your Account, your BIG Member ID, your BIG Points and any other information relating to you under the BIG Loyalty to any regulatory authority or governing body established by any authority having jurisdiction over us. In particular, you further understand and acknowledge that we are entitled and need to share and disclose your information to AirAsia and Tune Money for the purposes of the BIG Loyalty. If we do not have your personal information or you choose not to disclose or share any information that we may require, we may not be able to provide or continue to provide the services and benefits under the BIG Loyalty to you, and we will not be obliged, responsible or held liable for the failure to provide the same (and/or any disputes in relation thereto). Any disclosure by us of the information referred to in this provision will not render us liable to you for any claim, loss, damage (including direct or indirect damages or loss of profits or savings) or liability howsoever arising whether in contract, negligence, or any other basis arising from or in relation to: the release or disclosure of the information by us; and/or the information being incorrect, erroneous or misstated; and/or reliance on the information, whether caused by us or other third party's omission, misstatement, negligence or default or by technical, hardware or software failures of any kind, interruption, error, omission, viruses, delay in updating or notifying any changes in the information or otherwise howsoever. You hereby agree that if we take legal proceedings against you because of a default in the terms of this Agreement, you shall be liable to pay to us all legal costs (including costs on a solicitor and client basis), charges and expenses which we may incur in enforcing or seeking to enforce any of the provisions of this Agreement against you. You shall hold us harmless and indemnify us against any liability for loss, damage, costs and expenses (legal or otherwise including all costs on a solicitor and client basis) which we may incur by reason of the provisions herein or in the enforcement of our rights hereunder. You irrevocably consent to the service of any documents, materials, product materials, notice or statement hereunder by ordinary post to your last known address in our records and such service shall be deemed effective on the 5th day after posting. You hereby agree that if any action is begun in the courts in Malaysia in respect of this Agreement, the legal process and other documents may be served by posting the documents to you at your last known address in our records and such service shall on the 5th day after posting, be deemed to be good and sufficient service of such process or documents. Think Big Digital Sdn. Bhd., Unit 19-04-02, Level 4, Wisma Tune, 19 Lorong Dungun, Damansara Heights, 50490 Kuala Lumpur, Malaysia. Our acceptance of any terms or any waiver by us of our rights or any indulgence granted to you shall not operate to prevent us from enforcing any of our rights hereunder this Agreement nor shall such acceptance operate as consent to the modification of any of the terms of this Agreement in any respect. We may, at our discretion from time to time without notice, waive our rights under this Agreement in certain circumstances. We can waive our rights without affecting our other rights. If we waive any right, we do not waive the same in other circumstances. The rights and remedies provided in this Agreement are cumulative and not exclusive of any rights or remedies provided by law. We shall be entitled at any time without your consent to assign the whole or any part of our rights or obligations under this Agreement with or without notice to you. This Agreement, Membership and BIG Member ID shall not be assigned by you to any other third party without our written consent. If any of the provisions of this Agreement becomes or is determined to be invalid, illegal or unenforceable in any respect under any law, rule or regulation, the remaining terms of this Agreement shall not be affected, and all other provisions of this Agreement will still be valid and enforceable and this Agreement shall be interpreted as if the invalid terms had not been included in this Agreement. This Agreement is a contract made under the laws of Malaysia and shall be governed by and construed in accordance with the laws of Malaysia. You consent and agree to submit to the exclusive jurisdiction of the Courts of Malaysia concerning all matters arising out of or in connection with your use of the Membership under this Agreement. You should always ensure that you provide us with your most updated and current personal particulars and information concerning your mailing and correspondence/permanent address, contact number, electronic mail address and other required details in order to ensure that your records with us are kept up to date, complete and accurate. If any information supplied by you changes during the course of your Membership with us, you shall promptly update your Account accordingly (especially with regards your mailing, permanent, correspondence or office address, electronic mail address or contact number) to enable us to update your details in our records. Failure to do so may result in information requested by you via mail regarding the BIG Loyalty being sent to the wrong person or wrong address. Any notice given by us shall be deemed given to you if sent by electronic or postal mail to the last known mailing/correspondence address of you, the Member as shown on our records. We shall NOT accept any notification of addresses' (business, office, residential or correspondence address) bearing a Post Box ("P.O. Box") number. If there is any conflict or discrepancy between the English text of terms and conditions of this Agreement and any translation thereof, the English text shall prevail. As our member, you’ll find that loyalty has its perks. Join now to be the first to know about exclusive deals and earn BIG Points faster and more easily to go further. Use BIG Points to redeem your next flight on AirAsia, be it for work or leisure, to over 130 exciting destinations. Be the first to know about AirAsia’s BIG sale and participate in our Final Call Sale where you can save up to 90% on AirAsia and AirAsia X flights every month. BIG Fixed Points is a member exclusive that allows you to easily redeem flights using fixed points based on the number of hours you fly. The higher your membership status, the more discounts you enjoy when you redeem AirAsia flights with your BIG Points. Receive exclusive offers and free gifts during your birth month and major festive celebrations. Stand to win contest prizes like passes to screenings, festivals, and other events! Earn BIG Points for the best value of your money with special promotions and offers by our partners. From long, exciting adventures to the simplest daily necessities, there are many ways to easily earn BIG Points. It’s that easy, so start accumulating points today! Earn BIG Points when you book a hotel, rent a car, visit attractions, or partake in leisure activities with our Travel partners on your next trip. Turn daily routines into adventures with our Lifestyle partners and earn BIG Points from your everyday spending. Convert your bank and other loyalty points to BIG Points for flights and exclusive rewards. Who says you can’t have fun and earn points? Visit us at our on-ground events and travel fairs. Play games, join our contests, surveys, and much more. It’s that simple! Impatient to grow your BIG Points balance? Purchase them during limited-time only campaigns with partners such as Samsung Pay and MyDigi at incredible prices and redeem flights and rewards! Indulge in retail therapy with BIG Loyalty, your new, favourite one-stop shopping experience. Buy whatever you like and earn BIG Points, be it everyday necessities, electronic gadgets, home appliances, or fashionable must-haves! You’ve earned it. Now turn your BIG Points into your next adventure. Your points enable you to take your travel and lifestyle choices further. Redeem a one-way flight from as low as 500 BIG Points! Our Final Call Sale is 90% off market rates and takes place on the first Monday of every month. Go the X-tra mile with savings of up to 80% by redeeming AirAsia X flight deals . Final Call X Sale happens on the third week of every month. BIG Fixed Points lets you redeem flights at up to 70% discount based on your flight’s travel time. It offers you great value and the convenience of planning your trips in advance. Whether it’s a beach retreat or a city stay, members get to choose the accommodation they want to make their next trip so much more rewarding. Take your trip to the next level with an exciting travel itinerary packed with handpicked activities, attractions, and things to do at over 130 destinations. Express yourself with fashionable and trendy must-haves of the season and other chic Lifestyle offerings from over 238 partners. If you're low on BIG Points or saving them for other rewards, just get a top-up to redeem flights! The BIG Loyalty mobile app is the easier, faster, and better way to experience your BIG Membership. Get your very own digital BIG Membership card. Be the first to be notified of exclusive flight deals and partner promos. Search and redeem flights on the best travel dates. Check your BIG Points balance and BIG Member details instantly. Pay less for flights with BIG Points! BIG Points are just as good as cash! 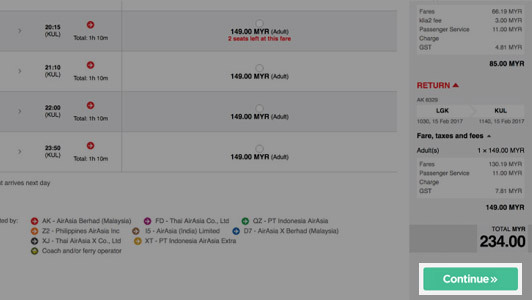 Use them to knock off a portion of your flight fare on airasia.com for more savings. Follow this guide to claim your BIG Points for more travel adventures! Input your desired flight destination and dates. Click Continue to proceed. 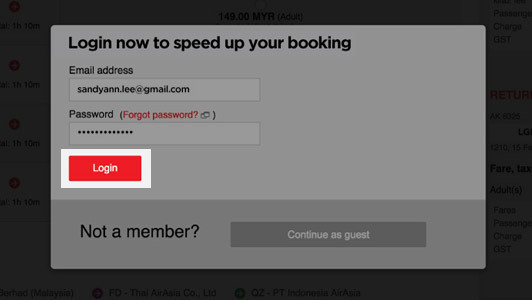 To speed up the booking process, log in with your email address and password. Ensure that your BIG Member ID is correct to earn your BIG Points. If you have registered as a BIG Member before your flight, your BIG Points can still be claimed up to 60 days after your flight. Note: Only the passenger of the flight is eligible for BIG Points claim. BIG Points will be reflected in your account within 5 days from your departure date. Earn qualifying flight sectors for purchase of any AirAsia flights. BIG Points are not awarded for promo fares or add on services related to promo fares. Qualifying flight sectors or BIG Points are not earned on redemption of flights. Other Terms & Conditions apply. * Shown points are estimate calculation and based on normal fare.